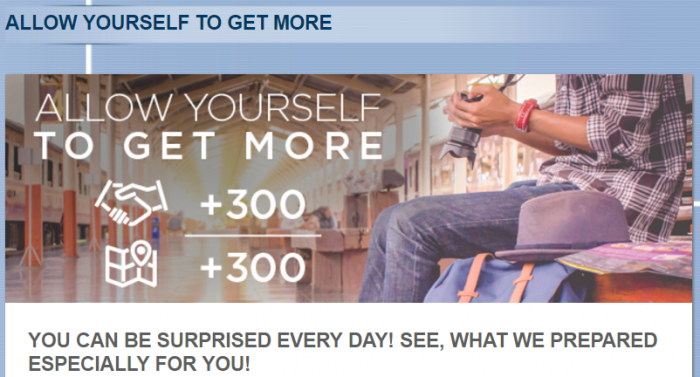 Le Club AccorHotels has launched new promotion for up to 600 bonus points per stays for stays in Poland, Latvia and Lithuania consumed between August 9 – September 30, 2016. You can earn 300 bonus points for weeknight stays (Sunday to Thursday) and 300 for weekend ones (Friday to Sunday). You can earn up to 600 bonus points for staying 4 nights both week and weekend nights. You can access and sign up for this offer on Accor’s website here. Note that this offer is only valid for stays booked August 8 – September 11. Some bonus points for Le Club AccorHotels member stays in these three countries. I am actually flying out from Warsaw in late September but have not decided yet where I’ll be staying at in the city. 1. General Le Club AccorHotels terms and conditions apply to the Allow yourself to get more offer and you must be Le Club AccorHotels member to benefit from it. 2. This offer entitles Le Club AccorHotels members, regardless of their status, to benefit from earning 300 for a stay in one of the participating hotels in Le Club AccorHotels Loyalty program. 3. This offer is valid for a member’s stay from 09/08/2016 to 30/09/2016 in one of the participating hotels in Poland, Lithuania and Latvia, and booked between 08/08/2016 and 11/09/2016. 4. The stay must be a minimum of 2 consecutive night(s). During the working week OR during the weekend. b. In case of staying at least 4 consecutive nights – 2 consecutive nights during working week and 2 consecutive nights during the weekend – members get 600 points. 5. Any consecutive stays (check-out and check-in same day) in the same hotel, will be considered as a single stay. This single stay will be eligible once to the Allow yourself to get more offer. 13. Please specify the reference 47368 in all your communications with AccorHotels call centers or customers care services related to this offer. You must register for the Allow yourself to get more offer before proceeding to the booking, to be eligible to the offer.